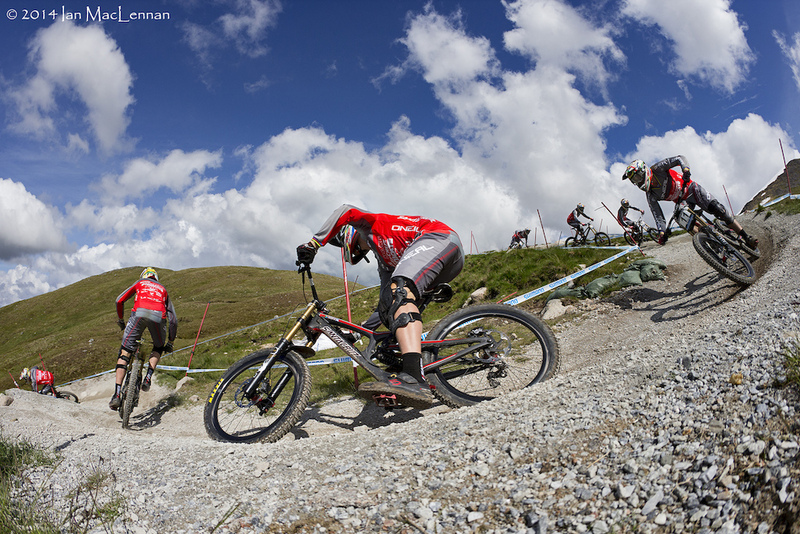 Fort William never fails to excite the crowds; high speed, a track which takes no prisoners, tight racing, and of course a field stacked with top riders from around the world mixed with the fastest Brits too. The track is running fast this weekend and that makes for tight racing and big crashes because when you go down here in Scotland, you go down hard. Qualifying too out several riders who were expected to do well yet weren't in the protected top twenty, and this left the door wide open for some new blood to make it through to finals. Rear mechs in spokes, destroyed chain devices, and of course punctures are the usual suspects of mechanical failure but there were plenty more than just the usual. The weather played havoc too, forecast high winds having forced the organisers to move Saturday's event schedule forwards to keep everything running. It was a sensible decision but definitely not appreciated by the riders who were left eating breakfast at 5am just so they could make practice when the lifts opened at 6.30am! And it was that wind which gave many lighter riders a nightmare as they tried to keep their wheels on the ground in a vague attempt to stay on track during qualifying. Sounds easy but let your wheels run light, get caught by a gust and just a six inch movement off line can cause a whole world of hurt from which you're not going to recover. Sunday's weather at varying points looked everything from sunshine to thunder storms, and that just continued the feelings of anticipation as to what was going to happen once racing started. The forecast storms thankfully never materialised and other than a few light showers, the weather took a back seat and let the track do the talking. It looks like a sequence but no, it's just Matt Walker (52nd) trailed by team mates Reece Potter (67th) and Matej Charvat (74th) early on in the weekend. 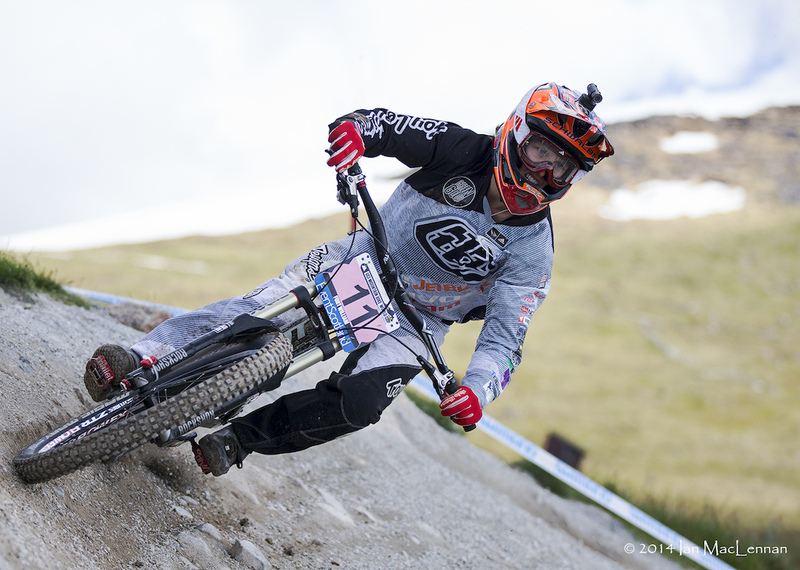 Ruaridh Cunningham has fond memories of the track here after winning the Junior World Championship on it back in 2007. After qualifying in 13th the pressure was on to replicate that in finals, and a slip of just 4 places to 17th can surely be considered a successful result to take from the next weekend. 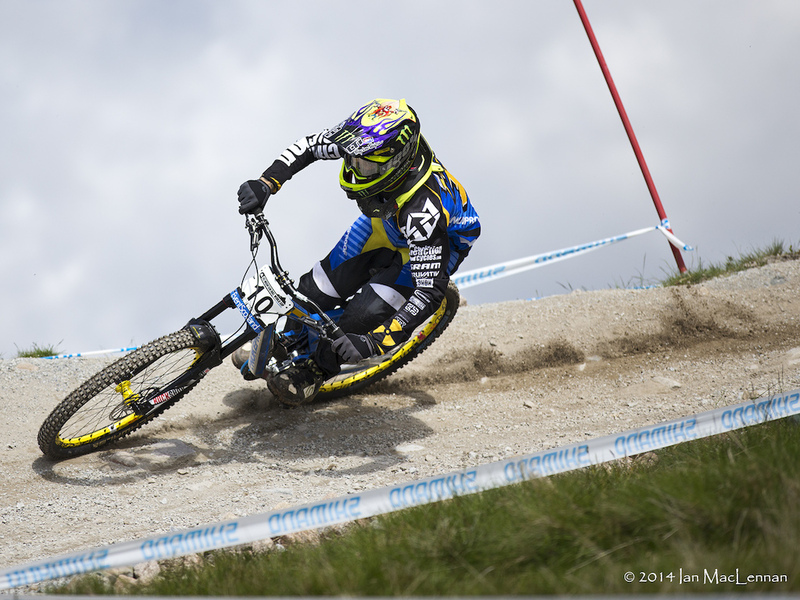 It was great to see Rachel Atherton back on track and looking strong after suspected burn out earlier in the year. Alas, it wasn't to be and the Brit was out of the race before it really began as a puncture first took away chance of a podium, and then outside assistance meant she was finally disqualified from the results. Patrick Thome was hard on charge after qualifying in 14th place for Scott. Hitting the first split with a time that would eventually sit him 16th, things began to unravel further into the run and the Frenchman eventually had to settle for 39th place. 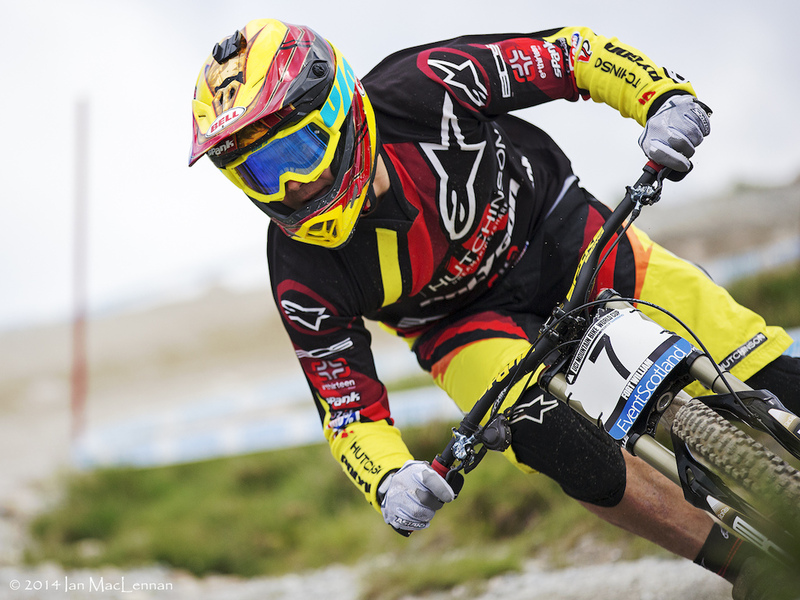 Martin Maes might be the enduro rider of the GT Factory Racing team but proving that enduro riders aren't just failed downhillers the young Belgian took a convincing win in the Junior category over Loris Vergier. Martin's qualifying time on Saturday would have placed him high in senior and amongst some big names, and the finals result was no different with a 4:51 that would have had him 31st. 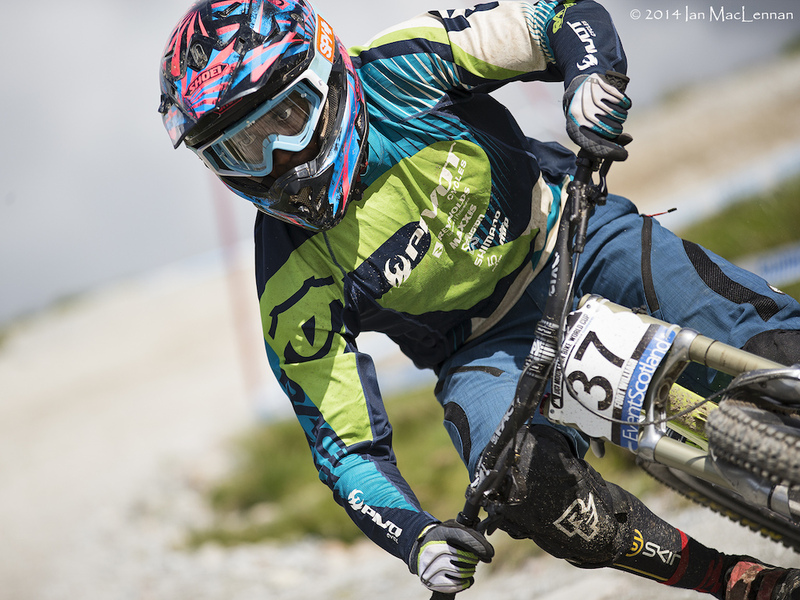 Part of the large contingent of Scottish downhillers currently trying to make their mark on the sport, Ryan Middleton is proof that the Junior race introduced last year is a great thing for progressing the sport and bringing young riders on. It gives so much experience of the full event without the need to worry about qualifying straight away. 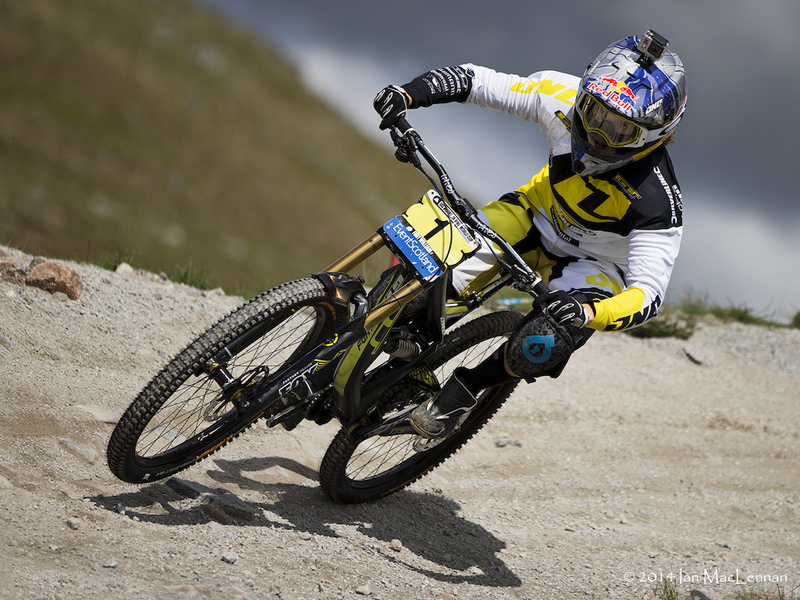 After six years on the Chain Reaction Cycles team with Nigel Page as boss, 2014 has seen Matt Simmonds move to the Saracen Madison team to ride alongside fellow Brit Sam Dale. A change is as good as a rest and 8th in qualifying was definitely a good result. The result of 15th in the final might not have been quite as good as hoped but it's doubtful that he'll be too unhappy with it. Super consistent, stylish and pretty well known for doing his own thing, Wyn Masters is a rider who perhaps has a following bigger than the beef of his actual results would lead you to expect. 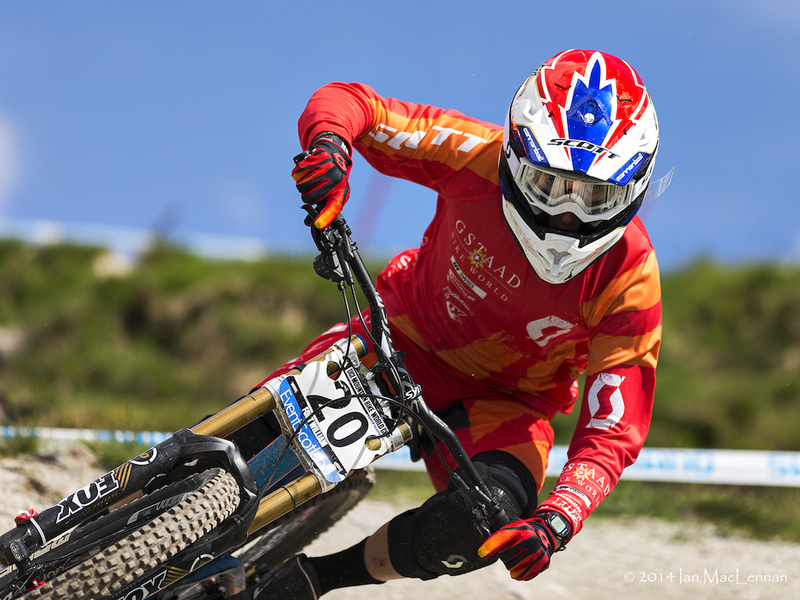 But that doesn't matter to anyone, and despite missing most of 2012 through injury the Team Bulls rider has kept it inside the top 50 at virtually every World Cup since, rounding out the trio of races so far this year with a 48th here in Fort William. With a National on the same track a month before there was plenty of pre-World Cup training going on with a seriously stacked field. 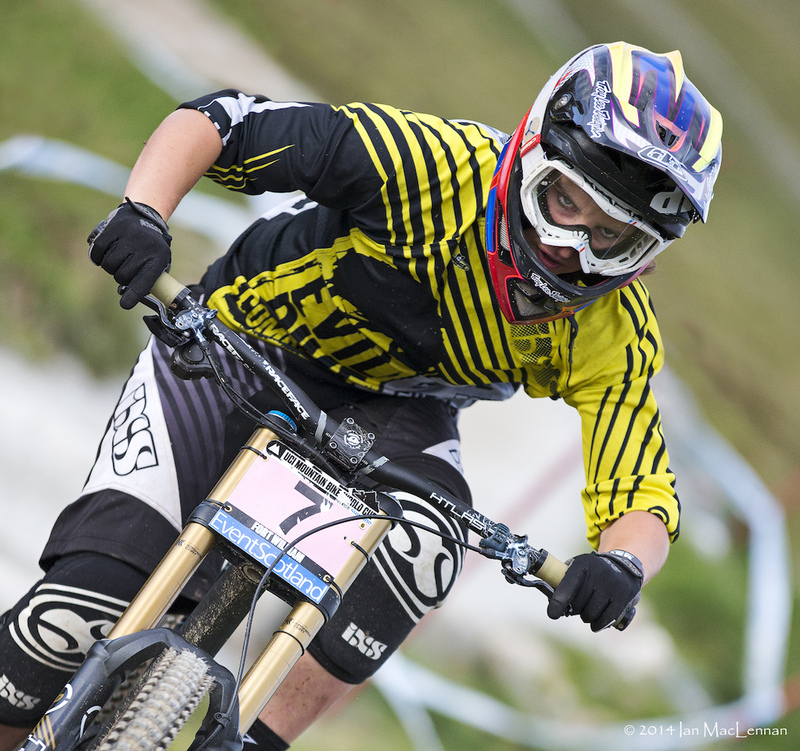 Morgane Charre took third there behind Emmeline and Manon, following that podium up with a solid 7th today for Evil Vengeance Tour. Mick Hannah's weekend didn't last long, a clipped pedal up top on Friday leading to a brutal crash which left him with a torn AC joint and torn ligaments. How that will affect the rest of his season remains to be seen with five races now on the bounce. By contrast his sister Tracey had a stormer of a weekend and converted a 6th in qualifying to a 3rd spot come Sunday's finals. When Myriam Nicole crossed the line she had a solid advantage over Tracey Hannah. 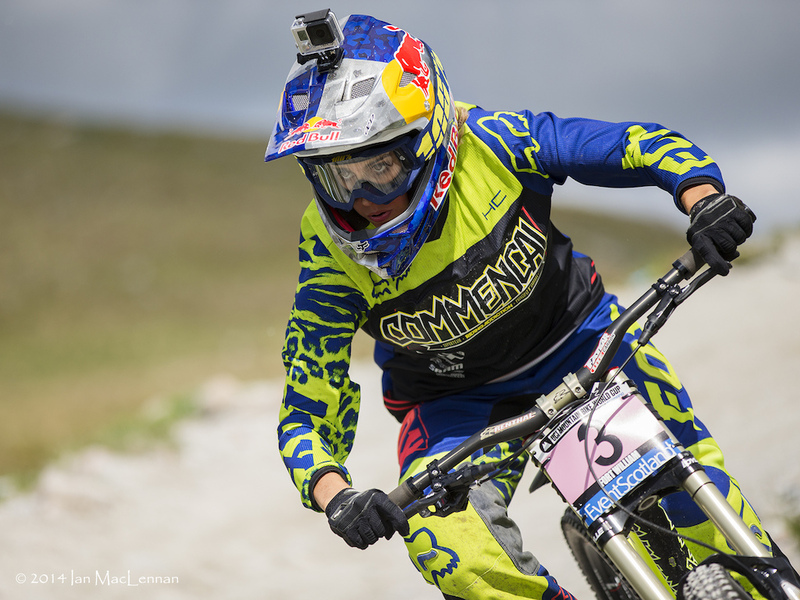 But it wasn't to last, the Commencal rider ending up being pushed down the order by Emmeline Ragot once she too crossed the line. 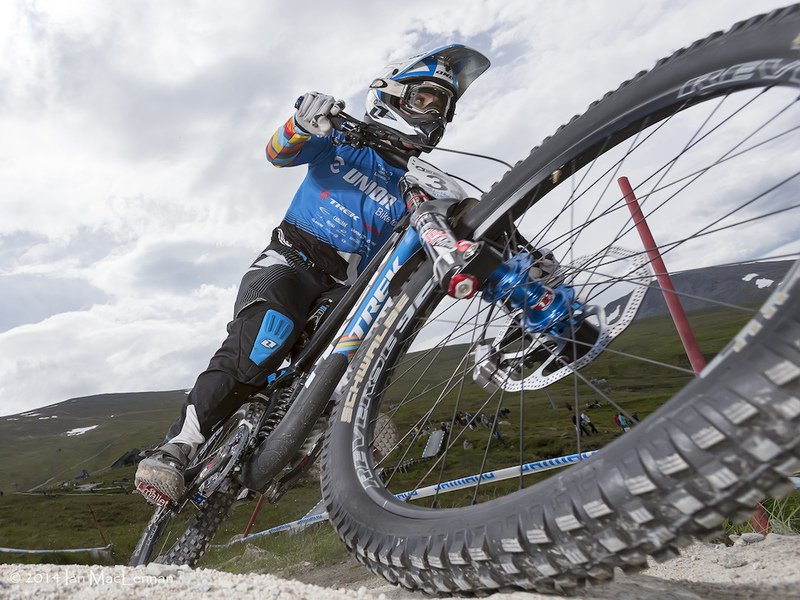 Sat at the top of the hill as the last girl to go, Manon Carpenter looked set to be on for a possible win after Rachel punctured but with the God of Punctures clearly feeling bored, bad luck took another bite at the British contingent and with it, any possibility of the win. Emmeline Ragot had a near fifteen second dominance as she crossed the line. This was eroded slightly to a margin of nearer seven but with the three top Brits all succumbing to rear punctures the door was left wide open for the French Lapierre rider to take a relatively uncontested win from Pom Pom. 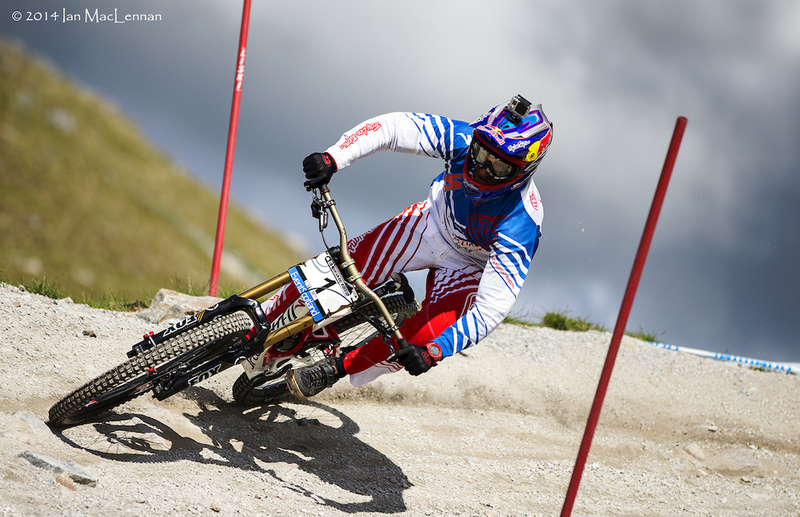 It's hard to believe that Steve has been going since the early nineties but the winningest man in downhill is still on it and still draws a crowd. 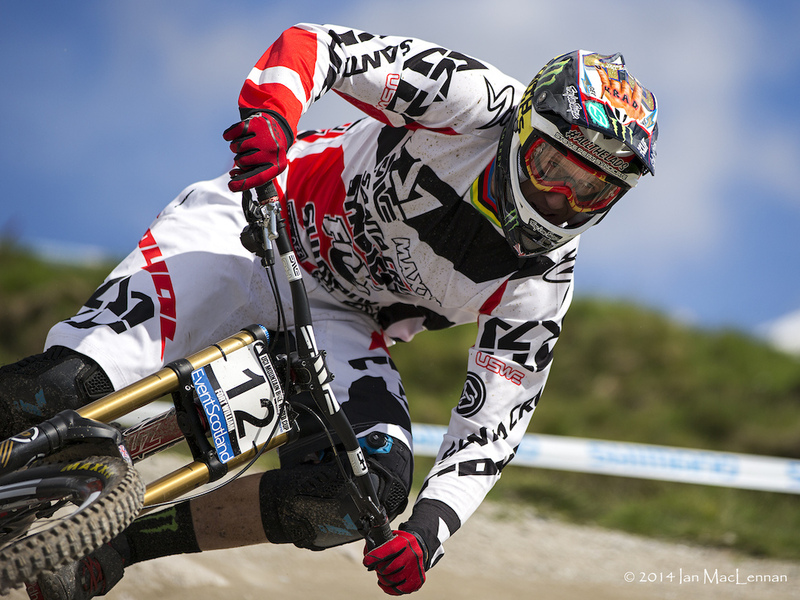 Peaty is a brand name, an institution, and still a competitive rider. That he turns 40 this year and yet he's still knocking on the door of top twenty World Cup results is testament to just how bad the racing spirit still burns inside him despite being up against guys less than half his age. In some sports that isn't really a major issue, but in a sport as brutal on the body as Downhill you can bet he's reminded of every one of those past races when he gets out of bed each morning. Losing a pedal as you land what will always be known as the Tissot jump is a sure way to get the crowd pumped, especially with a split time going green. 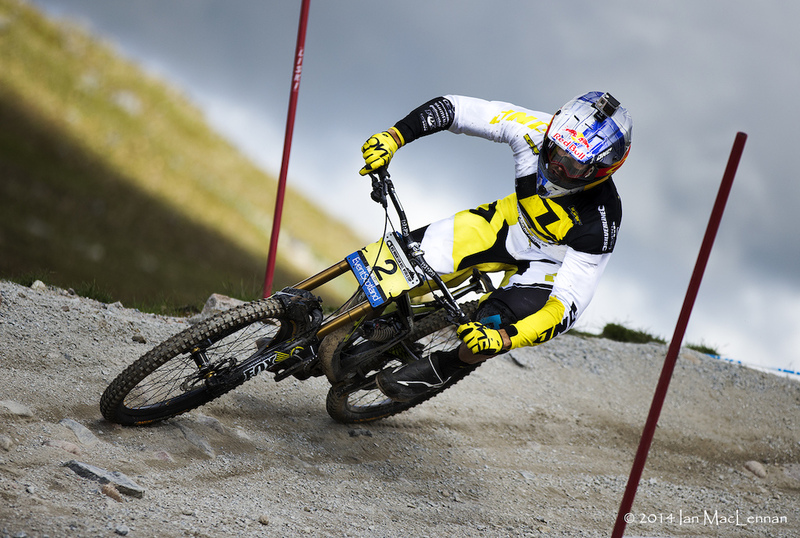 Loic Bruni did just that yet kept it together as if nothing had happened to cross the line in the top three. Josh Bryceland usually goes well in Scotland but, while the time was good, it just wasn't quite good enough and left him in 13th. 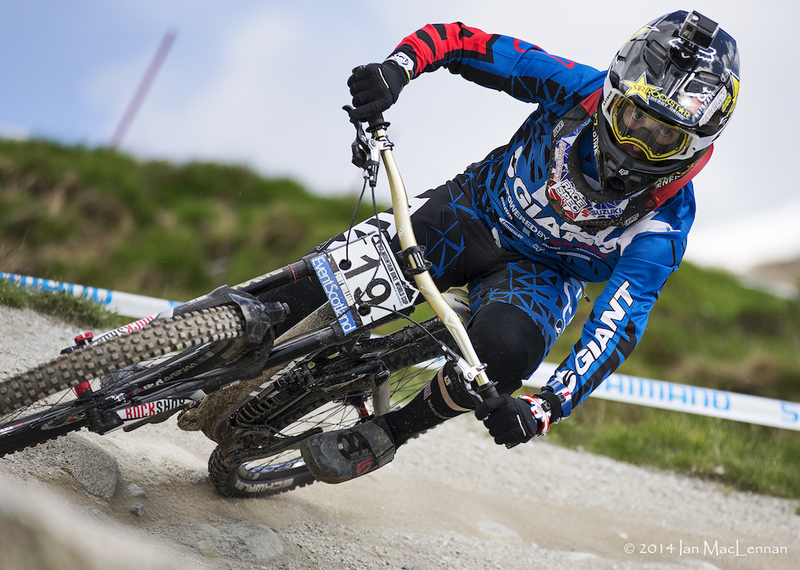 After a puncture in qualifying on Saturday Josh will be keen to move on to Leogang and make amends. 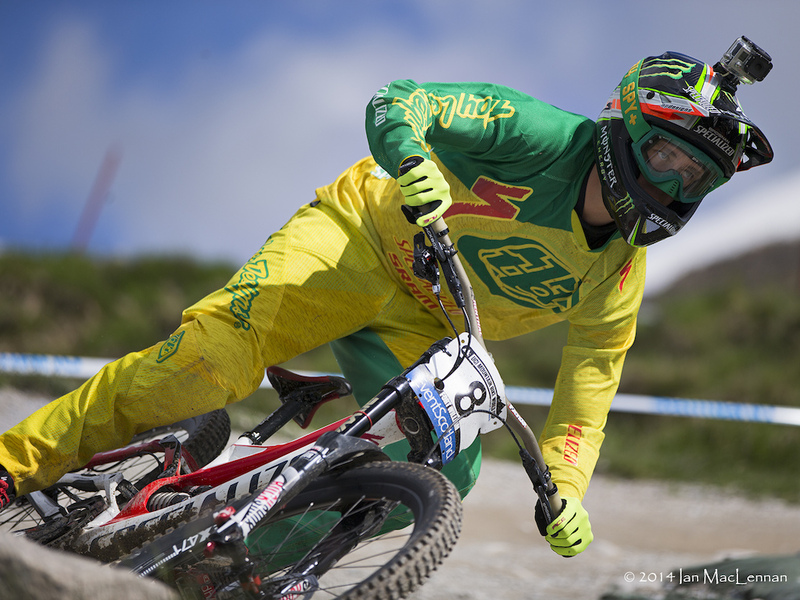 Greg Minaar is a rider you always expect to do well in Fort William, and just one more win would be enough to equal Peaty's record of 17 World Cup wins. His 100th World Cup was always going to be special, but could he convert the centenary into a win to really complete the fairytale? Over a second up at the split this was reduced to half a second at the line, but was it enough? 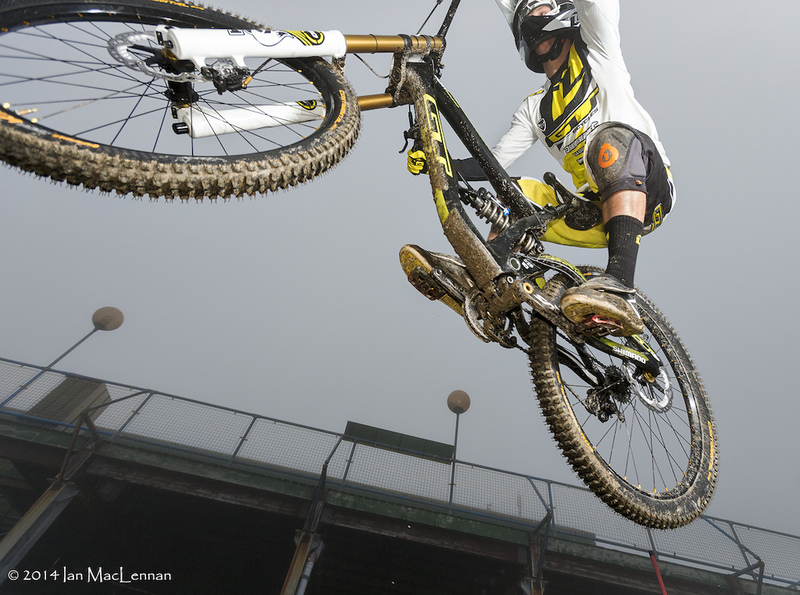 Eliot Jackson is a man with style for miles. A season out in 2013 meant the American was sorely missed by many on the circuit but he's back in 2014 and the circuit is all the better for it. 35th in the final was a definite step up from his 61st in qualifying. 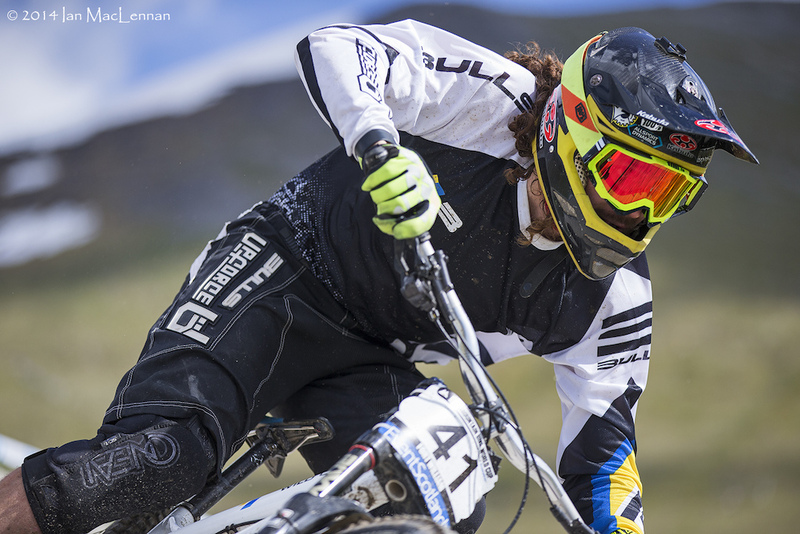 After qualifying in 67th with a slim margin of just a few seconds to the cut, Damien Spagnolo put the hammer down on Sunday to take his prototype 650B Mondraker Summum to 33rd place. Birthday boy Greg Williamson had an early run after a less than ideal result during qualifying on Saturday. It looked as though it may have been a blessing in disguise once the rain started to fall as he crossed the line to take the hot seat. The rain didn't last long but his reign in the hot seat did, his 4:44 doing him proud well into the final group of riders, finally being pushed out by Sam Dale but taking an incredibly hard earned 9th place. He managed 10th here in 2013 for his first ever world level top ten but one better this weekend and into the single digits is bound to raise another smile. A winter of training in the Scottish Borders clearly paid off, and with Anne Caro mulling over using the location as a winter training base too how long will it be before Innerleithen is truly put on the map as a prime location for racers to spend their off seasons? Here he jumps out of Friday morning's mist with little knowledge of what was to follow come Sunday. 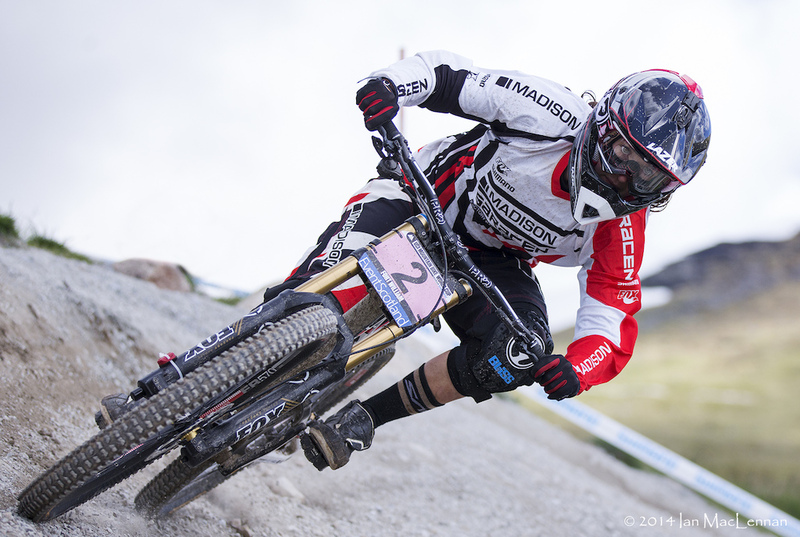 Brook Macdonald is another rider who can go well here but it wasn't to be this year, despite a solid 8th on Saturday, and problems up top, an often heard phrase, was the best way to describe a lowly 37th position on Sunday. 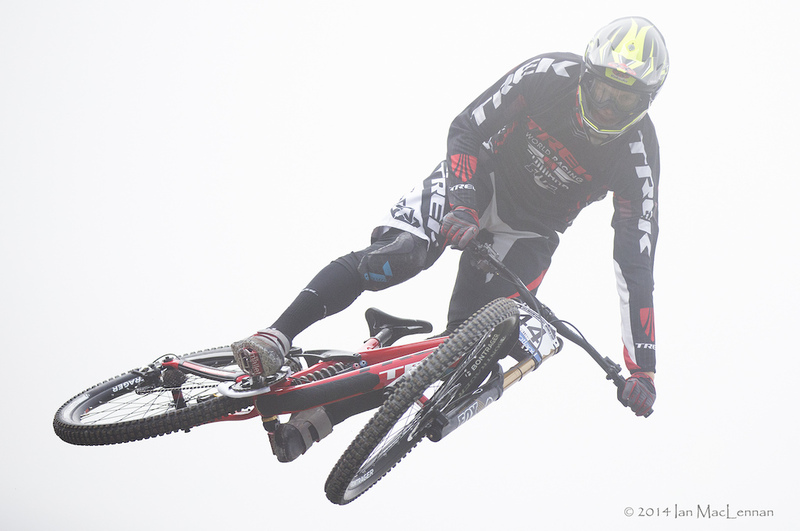 Always a favourite with spectators, it was a low key weekend in the top twenty for Brendan Fairclough. It was a solid result but many in the crowd will have been hoping, and wishing for more from the Brit. Gee hit the split 1.4s up on Smith, and the dominance continued down the motorway to be the first rider under 4:40 all weekend but by the time every rider was off the hill the Brit, who has previously won here ,had been pushed down to 5th. 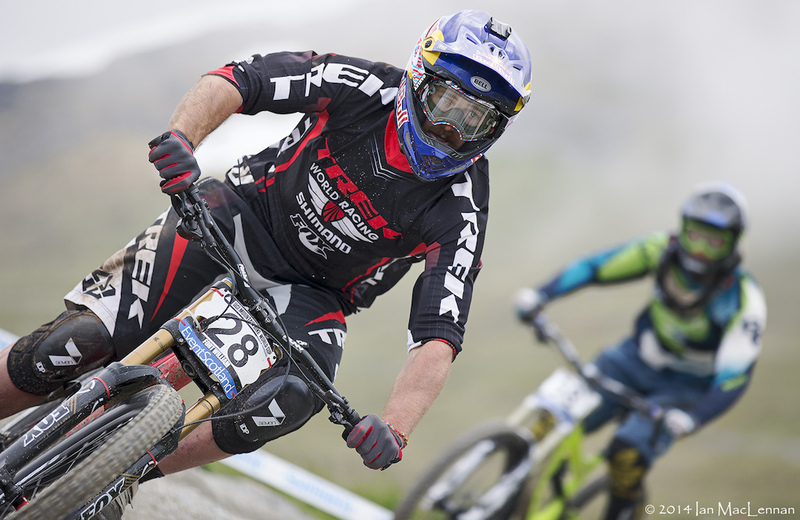 After a torrid season last year Aaron Gwin has pulled it back from the brink to recover the #1 board. Looking on fire through the rocks up top, the split was a hair's breadth in the lead as he broke the beam which translated into a 0.6s advantage by the line to push Gee from the hotseat. Would he still be sat on it by the time the last rider crossed the line? It wasn't to last and once the dust had settled 4th was the final result. After 4th in qualifying Sam Blenkinsop looked like he could be on a flier this weekend, and based on his speed through the top turns looked like he had the potential to be a real challenger. A puncture lower down cruelly robbed him of the chance to challenge for the podium but having not been out of the top six all year is indication that the pace is there, and the season is long. Danny Hart wasn't quite as flamboyant as normal on Friday which looked to be the slightly more serious racer coming out on show. The first two races masked the effects of a winter spent doing some serious training but the potential was always there for him to get back in the top three. Top twenty in the world is hardly poor but for a rider accustomed to podiums in recent years carrying the #19 board must have been a hard pill to swallow. Plenty of spectators were hoping that 2nd in qualifying was definitely a marker of intent for Sunday. Out of the start hut he was like a greyhound after the rabbit and didn't look to be slowing. One second down at the split on Hill but still up on Gwin's time. The intensity of the crowd increased further, could there be a British winner? Maybe, just maybe he could do it. He pulled time back on the motorway but not enough and crossed the line into second, just 0.4s down on Hill. A story of what might have been. At some point in the past few years Troy Brosnan has lost the fresh faced boyishness and become a hardened racer. At many points in his time against Gwin you could even say that the underdog has had the upper hand. Last man on the mountain here, his time from Saturday had already been beaten. The big question was therefore; could he go quicker still? Up at the second split going into the motorway the signs were good, could he hold it together for his maiden victory? Green at the line, it was enough and the crowd knew it. 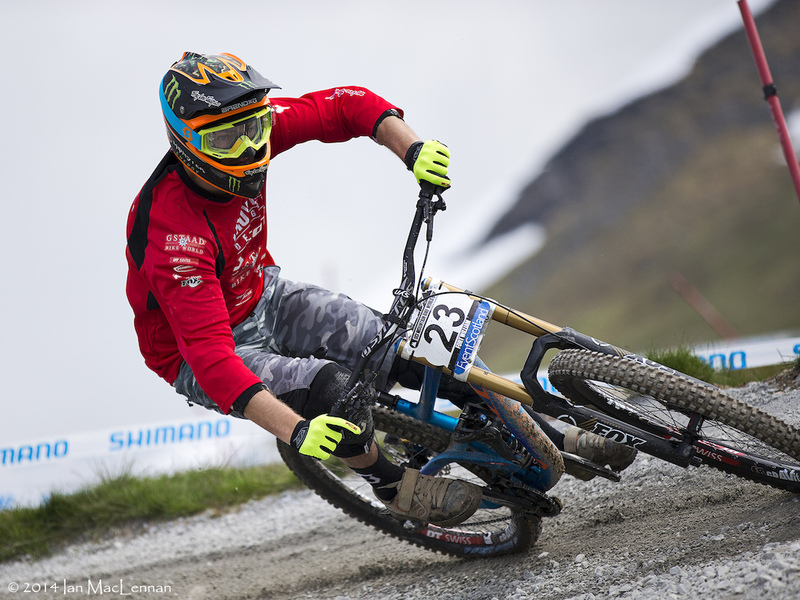 Fort William over the past few years has seen new faces on almost every podium and yet in that same hand of cards has also burned many big names. After this weekend Troy is another to add to that list of new names on the register of World Cup winners. 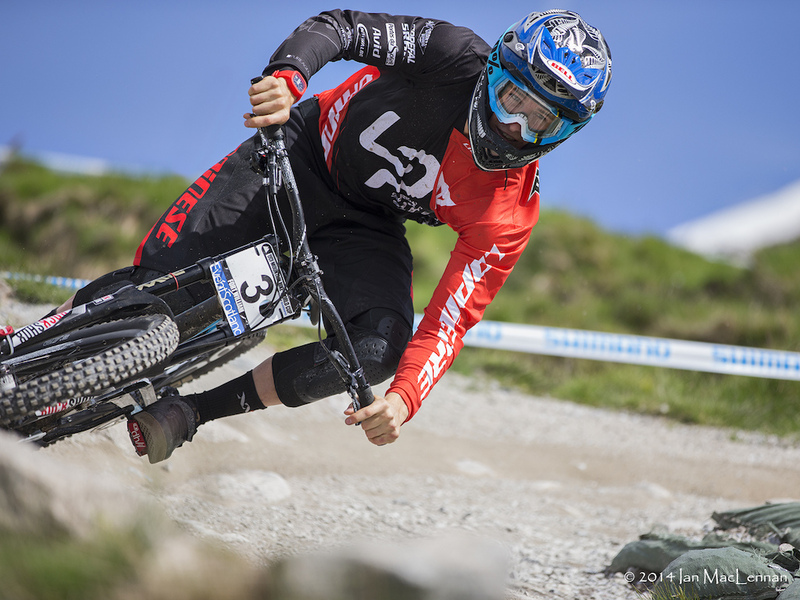 A dominant performance of 1st in qualifying and 1st in finals gives him a huge points boost to take him closer to his team mate going into Leogang, just one short week away. So there we have it, another great race at Fort William that gave another young rider a taste of what it's like to win big. With many races still to go this season there's every chance for Troy to win more and take the fight to his team mate. 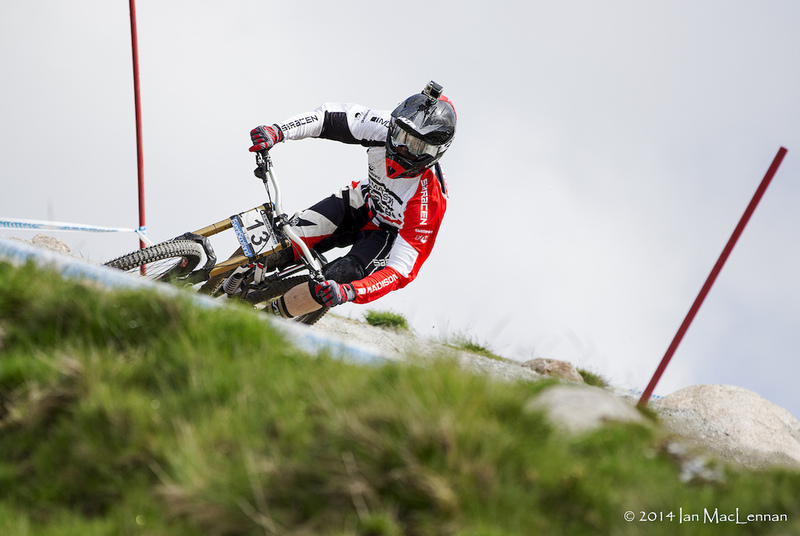 Who will reign supreme in Leogang? More pictures are in the album here. its strange seeing images, then reading about some entirely different moment. uhhh, where are actual race pictures? A few riders used them on their race runs, there is either some loophole or dispensation going on? 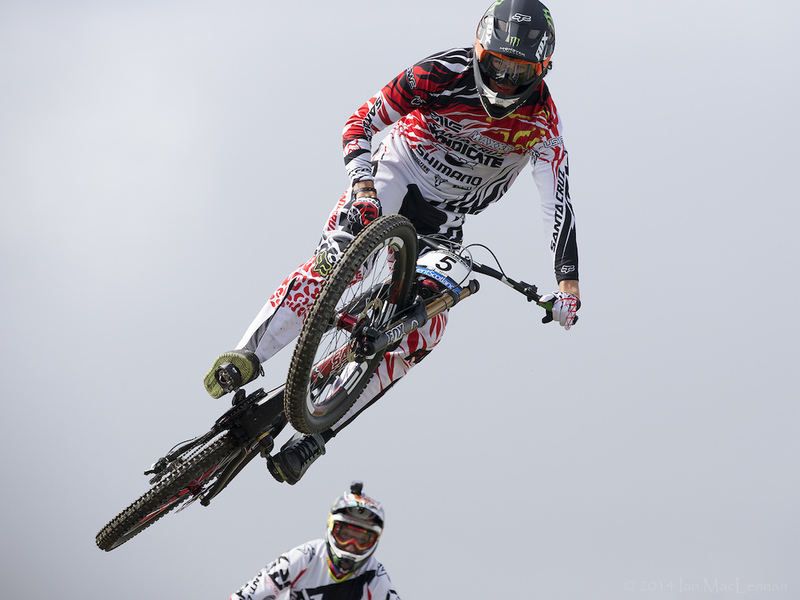 I also noticed practice footage from Minnaar from a chest cam which are suposedly banned?? Congratulations Troy. A well deserved win for a great guy. 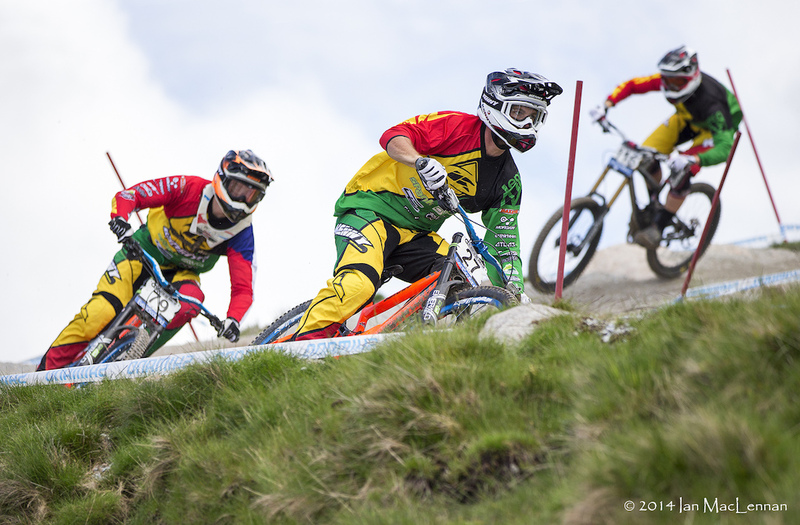 It was a great race to watch, seeing some local riders do very well. I really thought Hill had it in the bag right up until the end but that's racing for you. I felt pretty bad for Brook, he had a silly crash right in front of me and ended up down a bank in the woods and ended up losing a lot of time climbing back up to the point he left the course. Luck hasn't been with him lately but I'm sure he'll get back up there soon. Emmeline's easton wheel has TWO valve stems!! picture #14 ....two different chambers? That's the new schwalbe anti-snakebite thing, there was an article about it a few weeks ago. Bad luck Blenki, waiting for him to take one out this season! 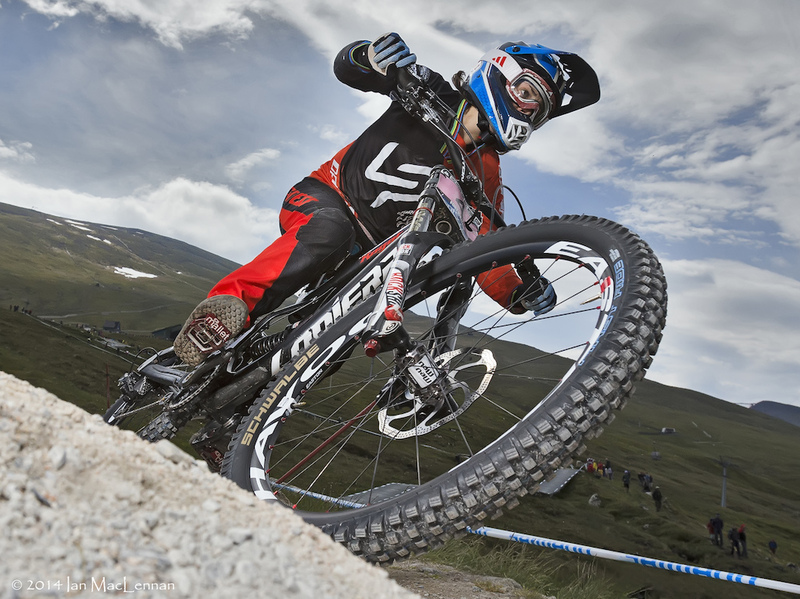 I once asked a Shimano sponsored WC rider why that was, and he said Shimano just don't make a good enough DH clip pedal. If they make a clip version of the Saint though then they'll be in business! I find them a bit tricky to get rowdy on and maybe the WC riders are the same, I find if you push them in corners they don't have a high enough release angle so they unclip. 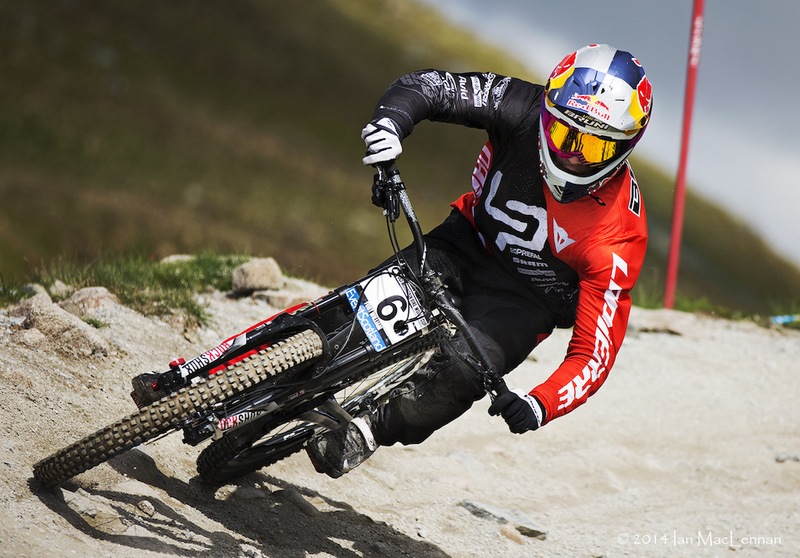 Today wasn't Greg Williamsons first World Cup top ten, he was in the top ten here last year too. 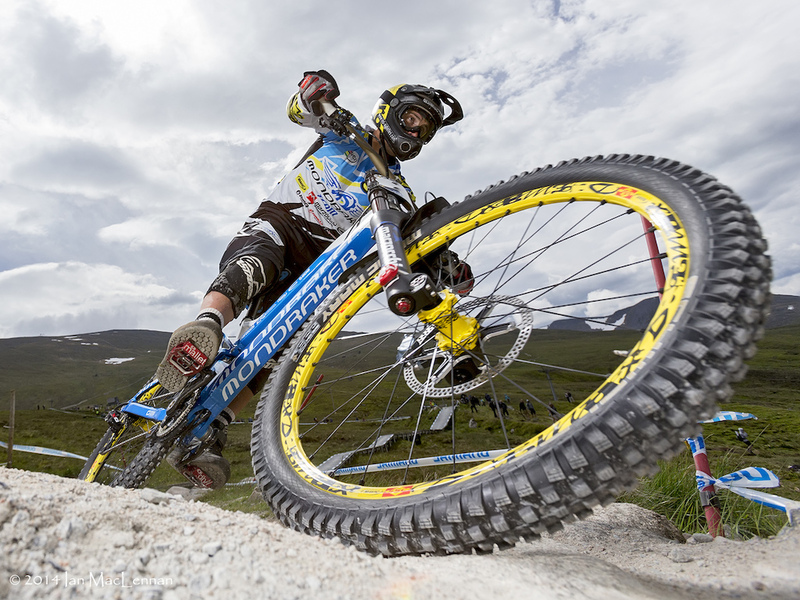 "Fort William never fails to disappoint the crowds..." ?? Eliot Jacksons fork on the picture... what is it? So were the spesh boys on 650b demos? Al or c? Typo, its Pom PON, not POM. 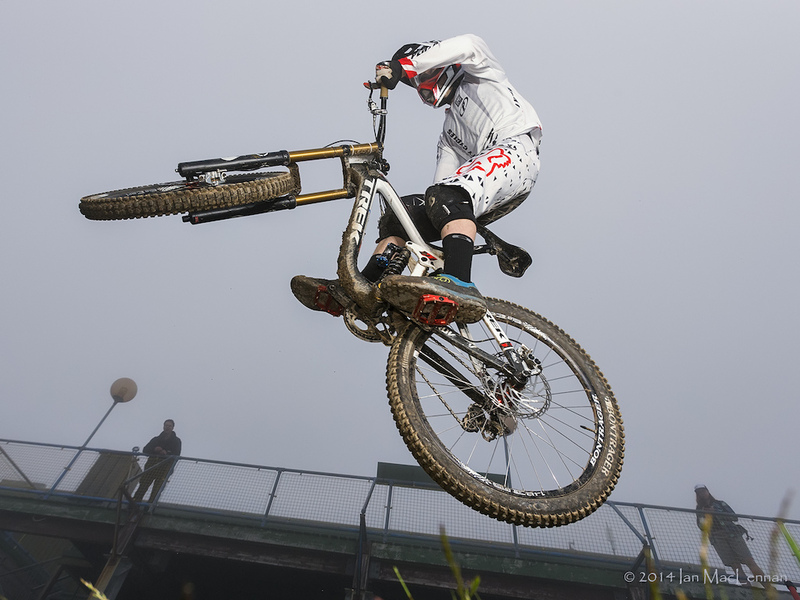 That's how you do it on a MX bike so I guess some riders like to keep their brake setup that way..? Oh, okay. Learned something new today. Britain and a few other countries run the brakes that way round. Its come from moto... Mx style))). By the way, that psyhoman that steal a bike from rider( hope you remember) on previous dh stage, had crushed because of this type of brakes setup)))). Sorry for my english. He was Australian, they run the same type of brake setup as the uk (moto style as you describe it). He just got caught out by the big compressions of the whoops. Just like not all British people run that setup either but it's very common and you're unlikely to find someone from either of these countries that run it differently, also just watch the video he doesn't jam on the brake..
What is so much better about having it set up like that? Interested in trying it. Every single bike sold in Australia is back brake left, front brake right - it's just normal for us. "the most important break" is the front break"
Nothing to do with MX, started well before MX was 'invented'. We drive on the left in the UK, passing others on our right and before indicators were invented we would signal our intention to change direction using our right hand. It's safer to slow the bicycle with the rear brake when riding with only one hand on the bar because braking force is much less severe, therefore the rear was placed on the lhs. It is the same logic which dictates that in countries where folk drive on the right and pass on the left, they would signal with their left hand and operate the safe rear brake with their right. It's illegal in the UK for a retailer to sell a bicycle with the front brake lever on the left.